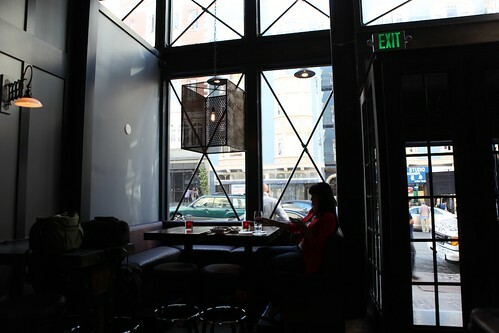 When we first moved to San Francisco, we never thought we'd spend much time in the Tenderloin. 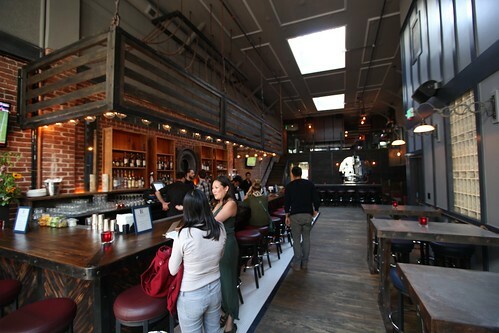 As it turns out, though, San Francisco's Tenderloin is a great place for cocktails. Sure, there can be some unsavory characters, homelessness, crime, and widespread drug use (we were once almost hit from a crack pipe falling from the sky! ), but the place and its people are still part of SF's heart and soul. A handful of the city's most beloved craft cocktail spots have found a home in the storied district—Bourbon and Branch, Rye, Jasper's Corner Tap and Kitchen, and Jones, to name a few. Now there is a new friendly bar opening next week. 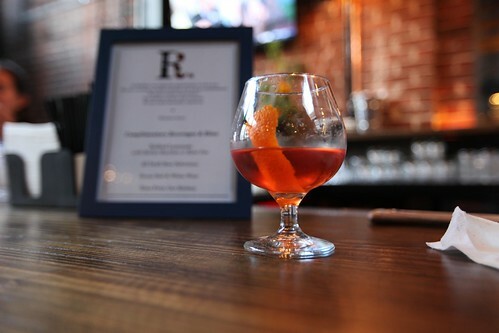 Brought to us by the folks behind Taverna Avertine, Redford will bring food, drinks, and an easygoing atmosphere to the neighborhood, starting June 7. 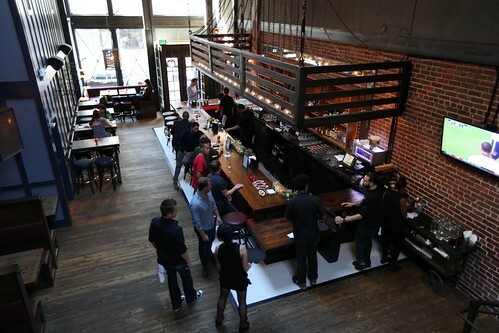 Josh and I were lucky to check out the new spot during a friends and family event last week. Some people will recognize the space as what used to be the club the Ambassador. 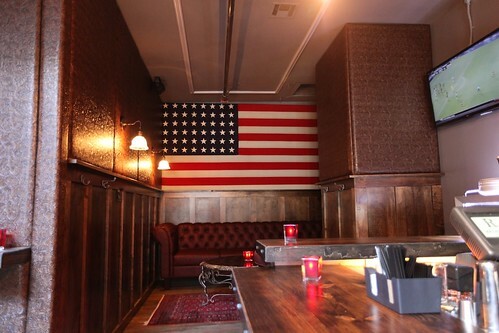 The space has been completely renovated into a modern two-tier Americana bar. The hope is that this down-to-earth design will bring people into a welcoming, easygoing atmosphere. The interior features beautiful wood and brick accents with large skylights and floor-to-ceiling windows in the front that let in the summer evening light—a big shift from the lounge it used to be. And also big wheel bar centerpiece. The Redford has two bars. One downstairs when folks first walk in the door. 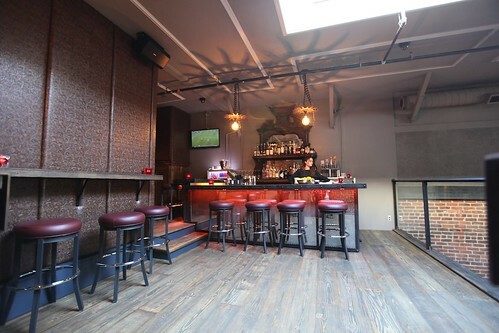 There is also additional space on a loft level, which can also be used for private parties. 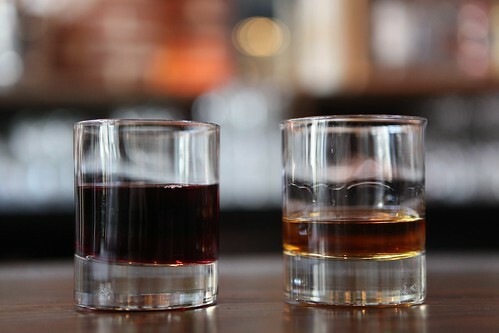 One of the most innovative parts of the menu a selection of whiskey and wine pairings. It was a lot of fun to try! We had never heard of such pairings before! 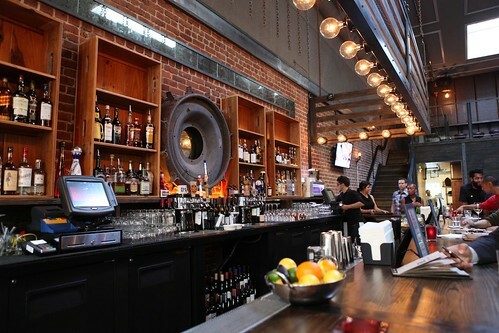 Unlike other bars in the city, the Redford owners have no intention of being a craft cocktail bar. The aim here is not to labor over the details of ingredients and execution. 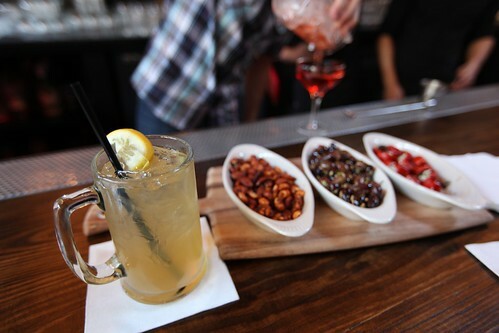 The emphasis is on quick, friendly service and accessible drinks. The cocktails are not fussy, easy to drink, and quick to make (so no long waits in line!). The trademark drink is the Redford lemonade—an ice-cold, spiked lemonade with a selection of either Bulleit bourbon or vodka. We tried the bourbon version, and it was so smooth! It was sweet and went down easily—perfect for those who are looking for something a little bit fun but without any burn. I look forward to drinking them on a hot day! 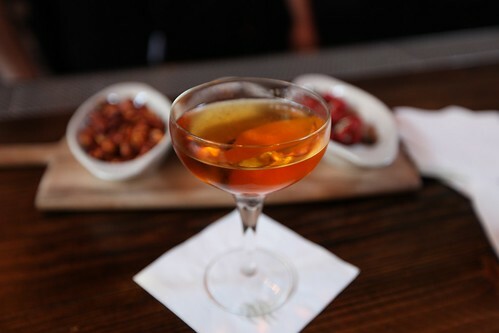 In addition, we also checked out the Martinez—a sweeter, more herbaceous cousin of the martini, made smooth and floral from a touch of maraschino liqueur. We also thought we'd try a classic, since we love them so much. What better than a sazerac! Here it is pictured in a lovely sniffer. One of the things that I really love about the Redford is that they serve food! In my opinion, way more bars in the city could stand to serve some food for happier, safer drinking. 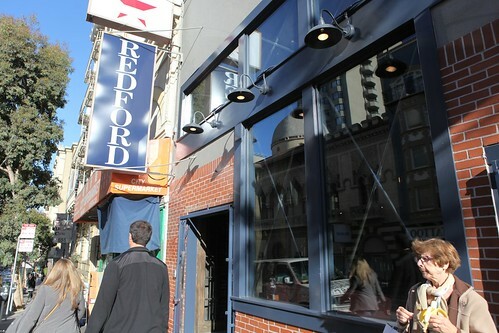 Redford's food brought rich, bold flavors to standup to the cocktails. The menu is divided up simply into a small, medium, or large category, so that folks could opt for a big, heavy meal, small bites, or even a light salad. 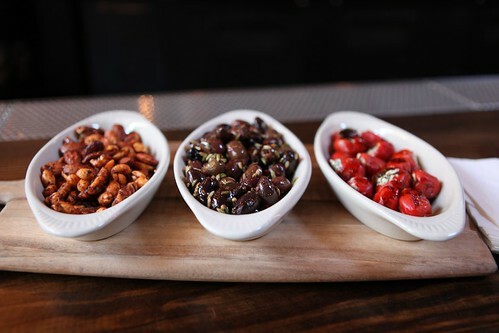 We snacked on a selection of nuts, olives, and small pickled peppers stuffed with cheese. 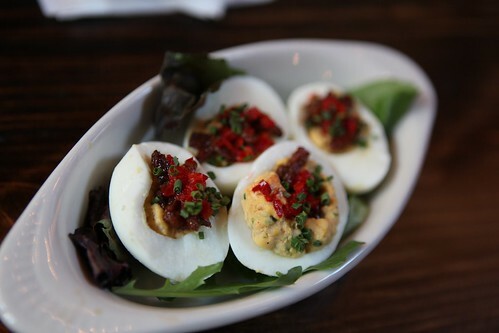 I tried a devil's egg, which packed a wallop. It featured bourbon-infused bacon sprinkled on top. 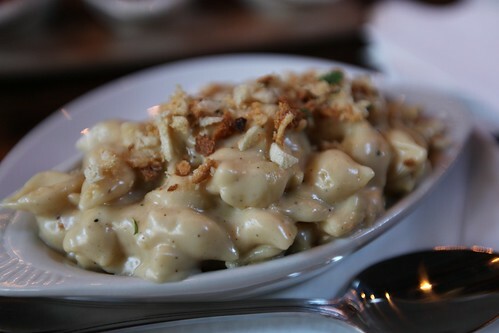 Lastly, for something more substantial to go along with the cocktails, we ordered some macaroni and cheese. Josh doesn't eat meat (as enthusiastic as I am about it), and they were very accommodating in serving it vegetarian. So creamy and easy to eat quickly!